Wooden board construction with shiny printed laminated design, brass handles. Large mirror on inside lid. 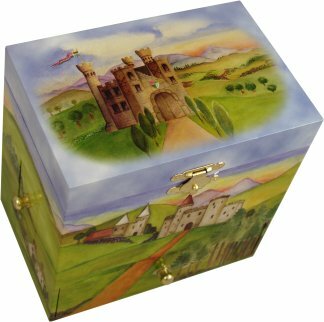 Clockwork wound from the back, open the lid & the prince & princess figures revolves as music plays. For beautiful princesses who love to hide their trinkets & treasures. This music box has four little drawers for secret storage ! One on each side of the box, front & back. 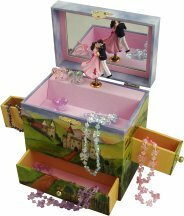 Open the jewellery box to hear the music play and watch the prince & princess dance to the music.